Research reveals how social enterprise is empowering communities and the impact it is having on the Scottish economy. The powerful impact of social enterprises in Scotland has been revealed for the first time by the publication of Social Enterprise Scotland: Census 2015. Headline results show that there are over 5,000 social enterprises in Scotland, with over 200 formed each year. 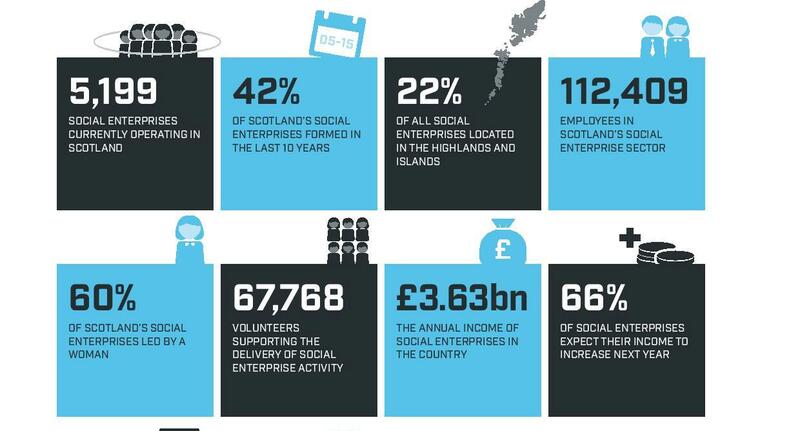 The Highlands and Islands have 22% of all social enterprises, with Edinburgh and Glasgow accounting for 26%. Social enterprises employ over 112,000 people across Scotland and 68% of them pay the Living Wage (from the Living Wage Foundation). Scotland’s social enterprises have £1.5bn in combined traded income and employ around the same number as Scotland’s food and drinks sector - more than the energy or creative industries sectors and well over half the numbers working in the country’s financial sector. The census also reveals that some 75% of social enterprises employ more than half their workforce locally too. The foundation of social enterprises in Scotland is underpinned by the size, development and growth of credit unions and housing associations - these two are the giants of social enterprises in Scotland. Social enterprises are also leading the way in terms of progressive business practices. An impressive 60% of social enterprises have a woman as their most senior employees, compared to 7% for FTSE 100 companies led by women. They also pose a challenge to private sector employers to pay the recognised Living Wage pay rates. According to Social Enterprise UK, social enterprises are businesses that trade to tackle social problems, improve communities, people’s life chances or the environment. They make their money from selling goods and services in the open market, but they reinvest their profits back into the business or the local community. As public awareness increases of the work of social enterprises, so do the questions about what they actually contribute to society. The Social Enterprise Scotland: Census 2015 reveals what’s been missing up until now, provides hard statistics about social enterprises and the kind of robust economic data that demonstrates their practical impact. Alex Neil MSP, Cabinet Secretary for Social Justice, Communities and Pensioners' Rights, The Scottish Government, said: "Social enterprises are making a real difference to the lives of people in our communities and have a major role to play in our drive for social justice. This census shows they are embracing the principles of fairness and equality with more than two thirds of social enterprises paying at least the living wage and with women taking on senior positions in 60 per cent of these organisations. We look forward to working with the sector in the period ahead." The research confirms Scotland as a world leading nation in nurturing social enterprise and recognises social enterprise as a more inclusive way of doing business. Social enterprises have a long-term aim and huge challenge but their vision is that all business will become social enterprises in one way or another.